Newquay lies on its north west coast and is the Cornish Riviera’s premier resort. 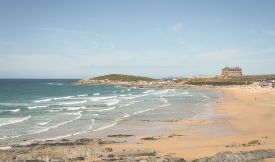 Newquay is surrounded by eleven magnificent beaches, the Fistral Beach being the most famous due to its association with surfing. Stroll along the many coastal paths affording stunning views, browse the souvenir shops or take a stroll down to the picturesque harbour. Monday 4th: This morning is free in Newquay. This afternoon we travel to Skinners Brewery. In 1997, armed only with his own surname, a chap called Steve Skinner dreamed of setting up a community brewery in Cornwall. On the banks of the Truro River, he and his family brewed a ground-breaking golden ale and named it after the tin-mining faeries of local myth. With Cornish Knocker, Steve set out his stall for concocting trailblazing ales, following it with another legendary brew, a brazen Cornish bitter called Betty Stogs, which CAMRA named Britain’s best bitter. Your dinner this evening will be with a Cornish twist. Tuesday 5th: A full day at the Eden Project, an exciting attraction where you can explore your relationship with nature, learn new things and get inspiration about the world around you. Dinner this evening will be a traditional fish and chip supper. Wednesday 6th: Morning visit to Truro, the retail centre of Cornwall and boasts an enviable range of independent shops and multiples. In a compact city centre, this strong and diverse mix is unique. Its intriguing and eclectic offer of art galleries, bars, restaurants, the Hall for Cornwall, Truro Cathedral and the Royal Cornwall Museum make it a year round destination. This afternoon we visit the Cornish Cyder Farm for a tour and tasting. Whether its picturing yourself pulping apples with the collection of historic cyder presses, riding through our orchards to see the fruit that is used weaving across the barrel-lined cellars, you’ll be amazed at what goes into everything that is made. This evening enjoy a 5 course taster menu sampling some of the best seafood Cornwall has to offer with a glass of Camel Valley’s sparkling wine. Thursday 7th: Sadly after breakfast we bid farewell to Newquay and begin our journey home. Situated overlooking Fistral Beach, the Fistral Beach Hotel and Spa boasts panoramic views of Fistral Bay, an indoor swimming pool and a fitness centre. Beautifully designed rooms with a flat-screen TV and tea and coffee making facilities.